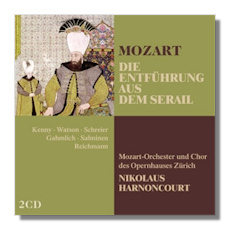 These two seminal recordings of these great Mozart operas have long been favourites in the catalogue. The refined sounds of the Zürich orchestras together with a veritable host of star studded soloists under the inspired direction of the Austrian maestro par excellence surely provides entertainment of the highest quality. 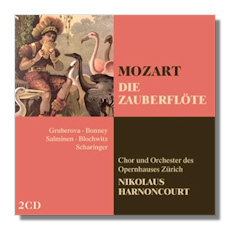 "Die Zauberflöte" remains my favourite opera by Mozart and Harnoncourt knows how to create that sense of mystery which permeates this great work. He is undoubtedly aided by his soloists which include Matti Salminen on true top form as are Hampson, Blochwitz, Gruberová and Bonney who bring particular delectation to their demanding parts. "Seraglio" is another great work which has that Oriental feel about it which suits Harnoncourt's lively tempi immensely. Again the soloists are on top form and the quality is well nigh unimpeachable with Kenny and Watson blending well with the experienced Peter Schreier. The score is full of admirable zest and energy with the lively Overture also one of the composer's most jovial. Warner are doing a great favour to budding opera collectors by releasing these beautifully presented sets which include a synopsis – the libretto may be downloaded over the internet with the striking design particularly enchanting. Recordings are always top drawer quality and one can build a fine collection through this budget price initiative. Highly recommended.